See the full guidelines on the Safe use of ladders and stepladders PDF from the HSE. As a reminder on why this is important: a third of all reported fall-from-height incidents involve ladders and stepladders – on average this accounts for 14 deaths and 1200 major injuries to workers each year. Whatever level of work you plan to have done, it’s generally best to have it all done at once to minimise the scaffolding costs. Every site is likely to have its own challenges and requirements but the above prices should give an indication of what scaffolding will cost. 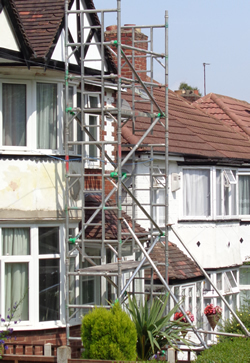 The cost of scaffolding includes the labour to deliver it, assemble it and take it down. So hiring a large tower and then having to move it five or six times isn’t necessarily going to be cheaper than full scaffolding. It’s better to think about the total area of the roof to be worked on. Towers and ladders only get you to eaves level. Access to the pitched area requires further risk assessment and equipment. Flat roofs are not without their risks, either; mainly around the edges.